Like a magnificent bolt from the sky, a new Lightning Pack has been launched by Indie Royale with four new games to pick up and play and love and such. Of course, every Lightning Pack so far has had some kind of theme, so what's the game here? Well, it's charity. Yes, every bit of money after credit card fees goes straight to Amnesty International, the EFF, ActionAid and UNICEF, and you get to decide how to divvy it up. The folks behind Indie Royale and the developers involved aren't looking for a single cent for themselves. How generous! As for the games, all can be Steam activated besides The Shivah, and only Osmos offers non-Windows versions. But as a bonus, donating over $7 will get you three albums: FX4 by Jake "virt" Kaufman who is the composer for many awesome soundtracks including Retro City Rampage, IN1ep by 6955 which is a brand new EP, and fan favourite chiptune composer Disasterpeace's Level album. Overall, it's quite a nice haul. But how about those games? Skip past the break with me and find out. Being the good little bundle blogger I am, I've kept up with nearly every indie bundle released since I started writing about video games. Of course, this means that I took a look at Osmos before, back when it was profiled in the Humble Android Bundle. While I think most of my previous post is still valid and makes a lot of sense, I always appreciate the opportunity to go back and re-evaluate my original stance. Before, I wrote that Osmos was a very pretty game with a great new age spaced out soundtrack, but in terms of gameplay it could be slow paced, luck based and annoying. This time, I think I've come around a little to the game design and outgrown my previous frustrations. For the handful of people out there who live under rocks and somehow missed its many variations and promotions, Osmos is a pretty unique take on some classic arcade gameplay. You are a microbe that needs to absorb smaller microbes and avoid bigger ones until you are the king of the Petri dish. 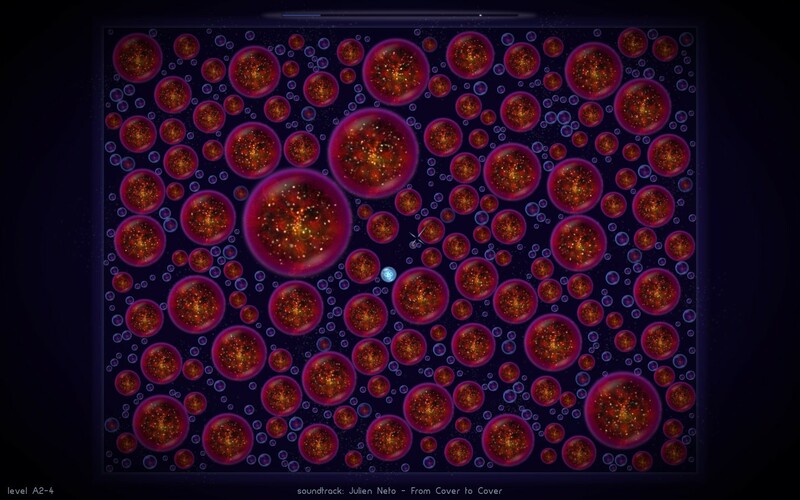 It's a gameplay style that's been around forever, but Osmos is probably the most definitive version of it due to the wide variety of modes and the way the game enacts Newton's third law of motion. The equal and opposite reaction in this case is the way your microbe jettisons little bits of its own matter for propulsion. This means fast speeds and quick reactions will reduce your mass quite a bit, which is a problem if you finally catch up to that juicy enemy and it eats you instead. When I first played Osmos, that's what led me to feel like the game was slow paced, but it really isn't so much if you're willing to be a bit more reckless. A few other things help support the repetitive recklessness, like the ability to restart levels at whim with new random configurations if the developer sanctioned levels don't work out. The three separate modes help a lot with this too, as each one is on a separate scale of progressions and allows you to stick to a particular favourite style of level. There's ambient levels, which are a little more relaxing and slightly puzzle based. 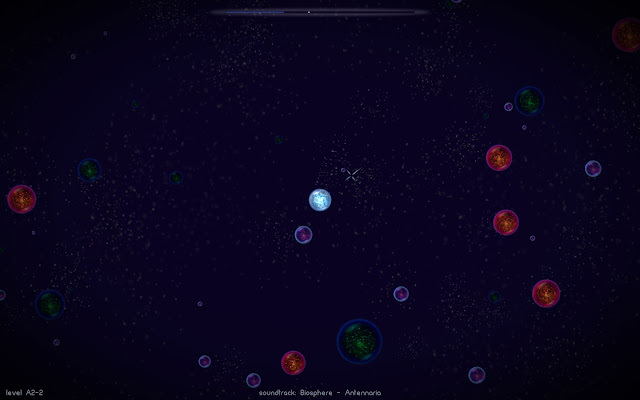 There's survival levels, which are fast paced and tricky combat scenarios where you need to eat other microbes before they outgrow you. And there's orbital levels, which are really intriguing in theory but quite hard to control in practice. Still, those levels are probably the most interesting in terms of design due to the constant chaos and out of control motion that comes from orbiting the level. Despite the calm music and soft visuals, Osmos can be an incredibly frustrating experience. But after making a fresh attempt at the game, I have to say that it's a very well designed sort of frustration, and definitely a worthwhile experience if you've missed it this whole time. It's a game that does an excellent job of expanding each distinct level design element slowly, but also doesn't force you through each element in a linear fashion. Osmos is definitely a fun experience in nice short rounds, allowing you to enjoy the visuals, the soundtrack (included as a bonus) and the challenge. Well this is certainly something different. It's rare to see a genre that's never been represented in an indie bundle, but this party game certainly fills that criteria. It's a fast paced one button competition that focuses more on what happens in physical meat space rather than what's on screen. As you can guess, it's multiplayer only and definitely a title suited for gatherings. Unfortunately the life of a game reviewer isn't a non-stop party, but I did manage to wake up and drag a very tired girlfriend through several rounds to get a feel for how it works. In each round of B.U.T.T.O.N. you and the other players are asked to take a few steps back, and are then given some kind of instruction (Stand on one leg! Stare deeply into the other player's eyes!) before the game reveals how to push your button. Each player has a buzzer, and the instructions can range from simply pressing it, holding it down, tapping it repeatedly or not pressing it at all. The winners are crowned, and a new round can begin. There's always a catch, and this one is right there in the title: Brutally Unfair Tactics Totally OK Now. When the game says that the first player whose button is pressed loses, it doesn't exactly have to be that player who presses it. If you're seven paces back and worried about losing, nothing stops you from grabbing them and wrestling your way to victory. Aside from what appears on the screen, it's open season. Make sure you play with friends you can trust to not punch everybody. Despite the stern lecturing about not drinking and B.U.T.T.O.N.ing at the beginning of the game, to me this seems like a perfect party game to set up after a couple of drinks. Of course, it could also just as easily be used at a family gathering or even to entertain kids for a birthday party, provided your kids promise not to kill each other. It's very manic, fun and quite a bit different from the usual Wii or Kinect party games because of the very loose rules. As a bonus, the DRM free version included in the Indie Royale has a too hot for Steam "naughty" mode. I didn't want to push my luck ("You woke me up to race you to your computer on one leg, and now you want to do it again except sexily?") so this intrepid reporter can't tell you exactly how naughty this is, but the main game itself is endlessly inventive and very lively. If you still need an endorsement, I can say that I definitely plan to use it myself next time me and my friends need a party game before a Friday out on the town, because I know it would suit the crowd I hang out with perfectly. It may not be what you expect from an indie game, but it's awesome to see a relatively low profile genre and how often can you pick up a new party game and donate to charity at the same time? While I rarely meet an indie game I don't like, I'm critical enough to get a bit jaded about certain oversaturated genres from time to time. 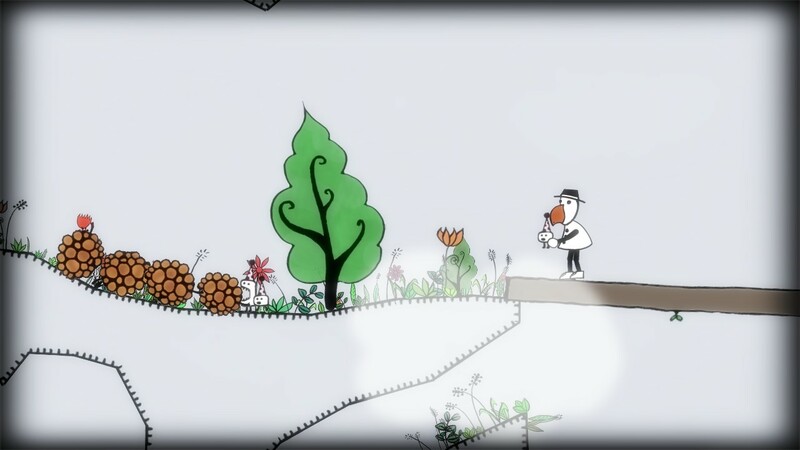 Artistic indie puzzle platformers are definitely one of those genres so, despite the fact that it won the IGF Grand Prize, I was a bit skeptical as I opened up Erik Svedäng's Blueberry Garden. But no doubt you've figured out my bait and switch by now, because I was pleasantly surprised by the short non-linear adventure. The art style is pretty, the music is enchantingly mesmerizing and the game's focus on exploration over physics or puzzles is a wonderful way to teach one how to play the game. The sense of discovery is easily the best part of the game, which makes me a bit cautious about explaining what exactly Blueberry Garden is. As crazy as it sounds, if you're already committed to trying the game I'd suggest you think about skipping this profile. Regardless, I'll tread lightly. You play as a sharply dressed bird exploring a minimal, vaguely Metroidvania-like landscape. By jumping around and gliding, you need to find objects to stack up and build a tower. There's no upgrades or abilities to learn as the game instead contains different varieties of fruit that provide temporary alterations to the capabilities of your bird. There's very little direction beyond the basic controls, so it's up to the player to learn things like how the fruit works and where exactly these stackable objects can be found. As the stack expands, the number of places you can access through gliding grows too, so there is always somewhere new to check out. But don't expect to be able to glide around forever, as there is a hard time limit on the game that will sneak up on you and render the game unbeatable. That single element is probably going to be a real sticking point for people, as time limits and unwinnable situations seem totally at odds with the relaxing piano and freedom of exploration. However, I personally like the time limit as the first time I realized I was being timed at all was a major revelation. The game itself could easily be beaten in half an hour if you knew where everything was (in fact, it doesn't even offer a save function), so the time limit serves as the metaphorical whip juxtaposed with the many carrots on sticks strewn throughout the game. Each time you restart, you enter the world armed with more knowledge about how the game works and therefore a better chance of winning it. I do understand how a time limit might irk people, but even with my forced restarts I managed to finish the game on my fourth try once I figured out what a particularly helpful fruit did. I have to say I was very taken with the game. 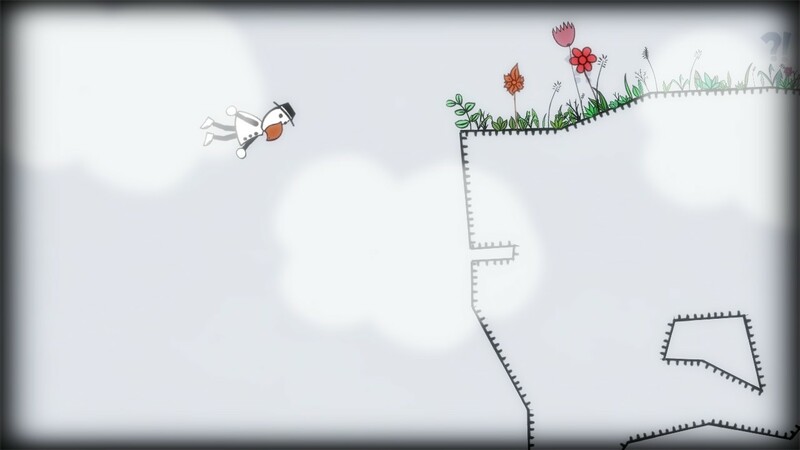 Amongst the many indie puzzle platformers out there, Blueberry Garden is definitely one of the most enjoyable and thoughtfully designed of the lot. I'm always perplexed whenever I hear someone say that adventure games are dead. Maybe commercial adventure games are dead, but there are dozens upon dozens of quality indie adventures released every year. Many of these releases come from the excellent Adventure Game Studio tools, of which Wadjet Eye Games is no stranger to. With a wide back catalogue that includes the upcoming Resonance and prior Royale alumni Gemini Rue and the Blackwell series, it's clear Dave Gilbert and company have a great claim to the role of the spiritual successors of games like Gabriel Knight and the Broken Sword series. But before those games came Mr. Gilbert's first commercial title, this humble tale of a rabbi and his crisis of faith. 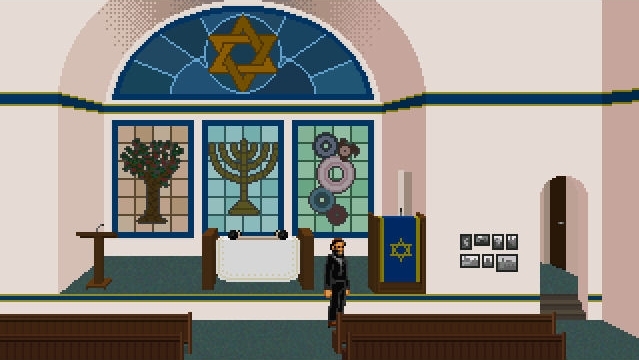 There's no doubt that The Shivah has all of the proper adventure game trappings, but I'm inclined to say that it has more than a passing influence from interactive fiction games. Like other Wadjet Eye games, The Shivah is very wordy and more than happy to use extensive dialogue cutscenes to tell the story. However, the dialogue is all very well written and the material itself feels more like the basis for an insightful novel packed with themes of responsibility, faith and a good old fashioned murder mystery. The spoken dialogue is a little bit more hit and miss, like most Wadjet Eye titles. I found the actor for Rabbi Stone to be more than capable of carrying the game, but some occasional awkward line readings or dips in quality sneak in. Like Blackwell and Gemini Rue, the story itself is completely engrossing. But the amazing thing is that unlike the paranormal humour of Blackwell and the mash-up setting of Gemini Rue, The Shivah remains interesting while staying fairly grounded in reality. 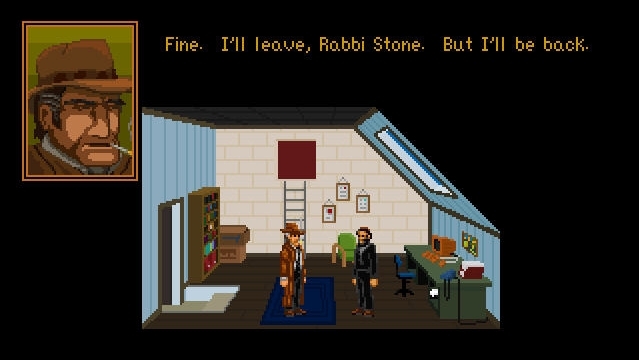 You play as Rabbi Stone, a rabbi struggling to make ends meet for his failing synagogue. One day he finds out that a former member of his congregation has been murdered, and that the victim has left him thousands of dollars that could easily solve his debt woes. But there is some kind of unexplained history between the rabbi and the victim, and Rabbi Stone's suspicions prompt him to seek out the truth. It's a completely engrossing mystery with plenty of twists, turns and revelations. The bits of adventure gameplay that crop up support the narrative well, with most of the annoying aspects of the genre left out. The one exception is instant deaths that pop up in the most unexpected places, so save often. But aside from the instant deaths, the gameplay always follows a logically consistent pattern and it comes up just often enough to break up the lengthy story sequences. The story is clearly the main focus here, as The Shivah is less like a game and more like a story being told through the medium of a game. Fortunately it's a really great story overall, with plenty of intrigue and clever moments—my favourite is the way that every dialogue question can be answered with a rabbinical question. While all eyes are on Resonance and the recently launched preorders, The Shivah proves that Wadjet Eye has been delivering great stories from the beginning. I'd have to say this is probably the most boldly experimental Indie Royale to come along in a while, but the games are great fun overall and the charity angle is always a plus. If you want to bottle a bit of lightning for yourself, the magic box below can assist you with that. And don't forget give me a follow, like the site and, uh, do whatever it is you do on Google Plus. It's always appreciated and I love to hear feedback and start discussions.